The holidays season is packed with festive occasions, and formal gatherings and cocktail parties are awesome, isn’t it about time you tried something new? 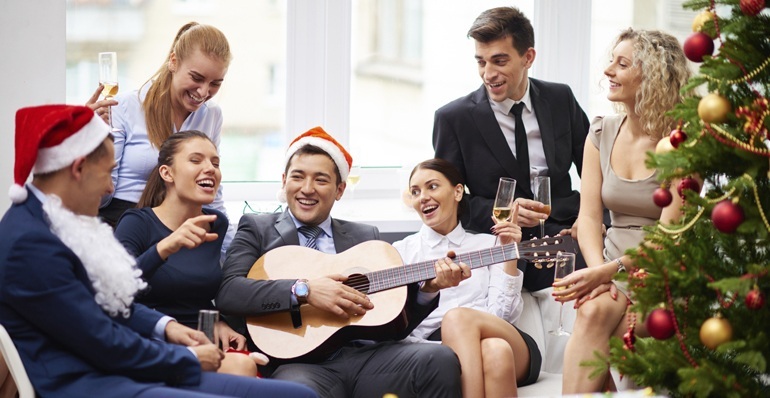 If you’re planning a holiday happy hour for your team or company, try one of these out-of-the box ideas to make your yuletide get-together a fun and memorable experience for all. Who said that Nat King Cole or Bing Crosby should have all the fun? More than likely there are quite a few closet crooners in your midst, so why not give them a chance to let loose in a Christmas-themed karaoke session? Not only will this provide plenty of laughs for the participants, but it will get everyone into the holiday spirit by filling the air with the classic Christmas tunes that we all know and love. Test the knowledge of your staff or team with a trivia showdown. Be sure to include basic questions that cover a wide variety of areas from history to sports, movies to music, geography to celebrities, etc. While you’re at it, you can sneak in some trivia questions about Christmas, your company, or any topics that are particular to your team or workplace environment – feel free to be as tongue-in-cheek as you want. The holidays are certainly a time to let loose a little. You can choose to create teams or have every person compete individually, and make sure to develop a system that awards points for correct answers. Winners can win prizes (gift cards, electronics, etc. ), or maybe even a much-needed day off! If your team hasn’t yet experienced this exhilarating thrill ride, they’re in for a real treat. An escape room is basically a real-life adventure game in which participants are locked in a themed room and challenged to escape within a 60-minute time frame. Your team will be tasked with trying to solve a series of brain-teasing puzzles and riddles that include many of the objects in the room, and as they begin to draw direction from the clues, they’ll be one step closer to finding the key that can unlock the door to freedom. In this one-of-a-kind experience, you and your colleagues will have to rely heavily upon your problem-solving and collaboration skills, which is one of the reasons why many companies choose escape rooms as a great team-building exercise. A premier escape the room Cincinnati venue is Houdini’s Room Escape, which offers three different themed rooms that can provide a fun, heart-racing and memorable holiday happy hour for you and your fellow participants. You bring the refreshments, Houdini’s brings the suspense! We’ve all seen this classic Christmas flick a thousand times, and there are so many memorable themes and memes from the movie that you can easily construct a party around this perennial favorite. Award prizes for the most creative costume (a full-body pink bunny outfit might take the cake), and don’t forget to include at least one leg lamp for good measure. Your next holiday happy hour doesn’t have to be generic or predictable. Use one of the ideas above to give your colleagues a unique and entertaining experience to usher in the holidays.